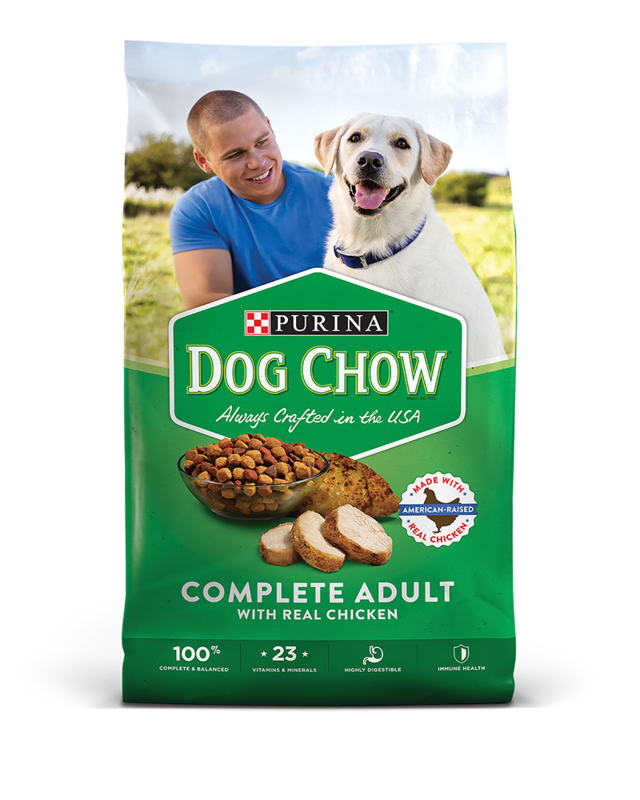 Purina® Dog Chow® brand dog food offers the Total Care Nutrition® your dog needs in the form of dry dog food targeted for your dog's life stage. We believe that strong dogs make stronger families. Our Total Care Nutrition® approach and range of products tailored to your dog’s age and lifestyle help him be at his best every day. Go to DogChow.com to find out which of our formulas is best for your dog. Made with high quality protein sources, including real beef, this tasty and highly digestible dog food recipe supports strong muscles and immune health. And with 23 vitamins and minerals, it provides the 100% complete and balanced nutrition that adult dogs of all sizes and breeds need to help live long and healthy lives. 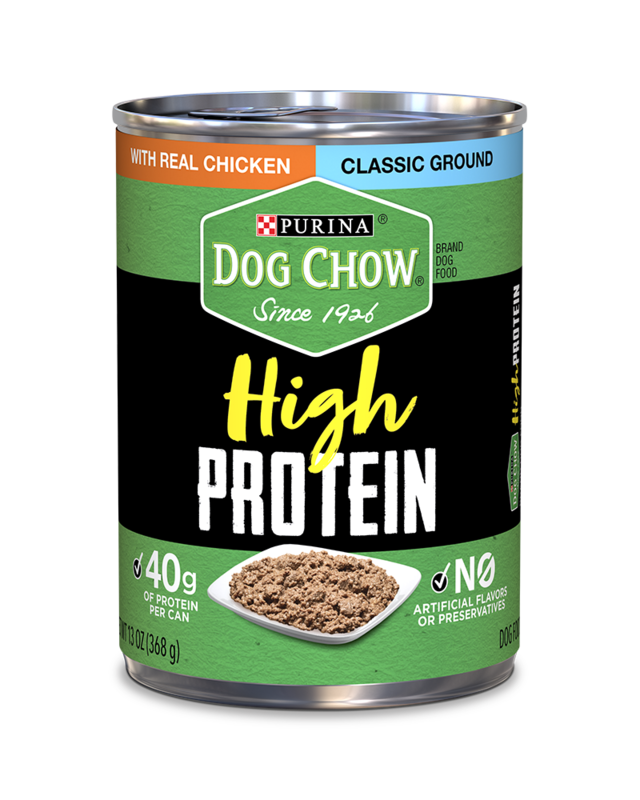 A complete meal choice for adult dogs, this delicious and highly digestible dry dog food recipe is made from high-quality ingredients — like real, American-raised chicken — that give your four-legged best friend the 100% complete nutrition he needs to help live a long, healthy life. With protein to support strong muscles, plus vitamins and minerals to support an active and energetic lifestyle, you’ll feel good every time you fill up his food bowl. 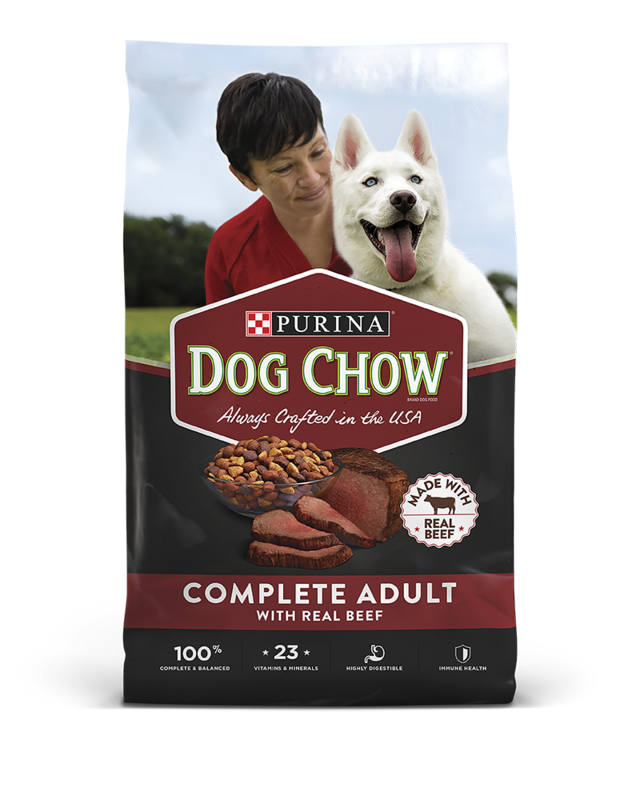 Give your adult dog the complete and balanced Dog Chow nutrition he loves in a high-protein ground wet dog food recipe. Made with real beef or chicken, 40 grams of protein per can, and no artificial flavors or preservatives, you can count on no leftovers in your dog’s bowl. Give your adult dog the complete and balanced Dog Chow nutrition he loves in a high-protein wet dog food recipe. Made with real beef, 40 grams of protein per can, and no artificial flavors or preservatives, you can count on no leftovers in your dog’s bowl. 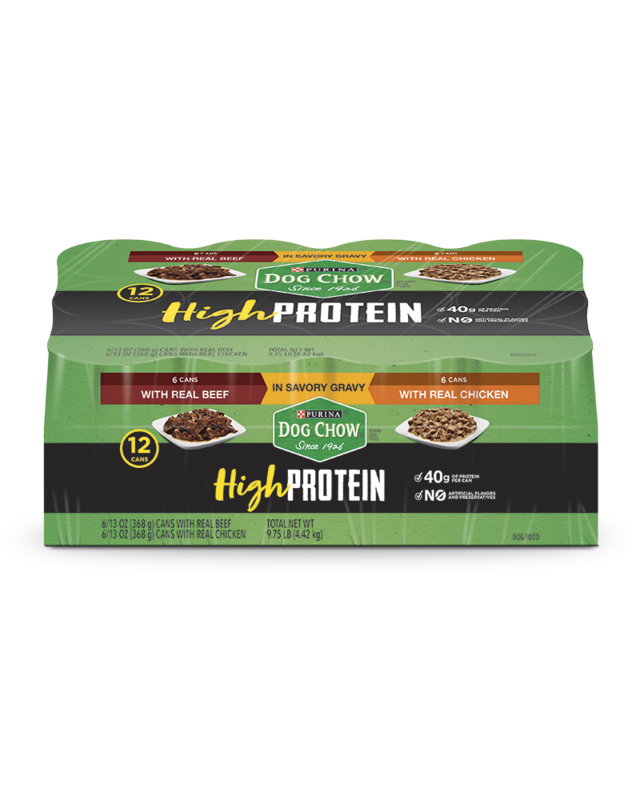 Looking for a high protein wet dog food that’s made with high quality ingredients like real beef and no artificial flavors or preservatives? Can do! 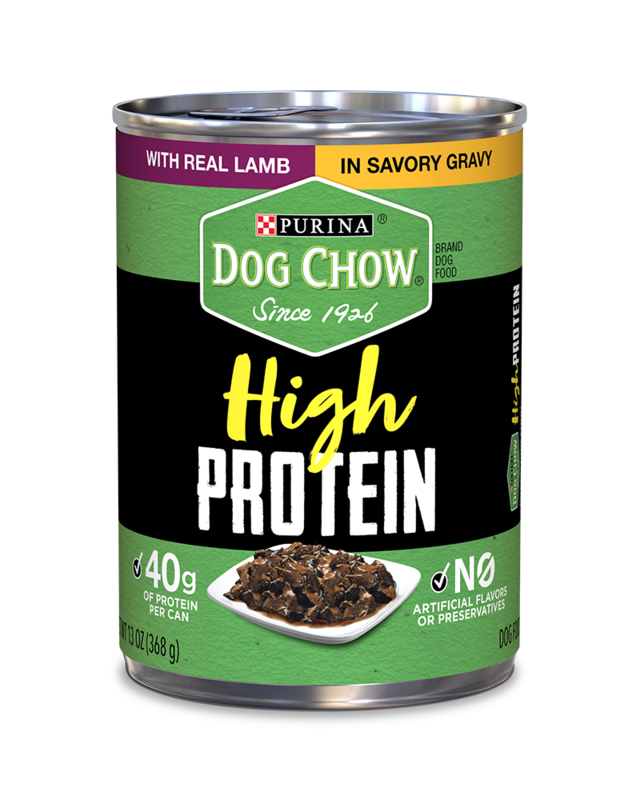 In fact, every can of this delicious chunk in gravy recipe boasts 100% balanced adult dog nutrition along with a whopping 40 grams of protein. Talk about quality fuel for your Fido. Meaty chunks made with real chicken. Savory gravy. 40 grams of protein per can. Get ready for your furry friend to show his thanks in a big, big way. 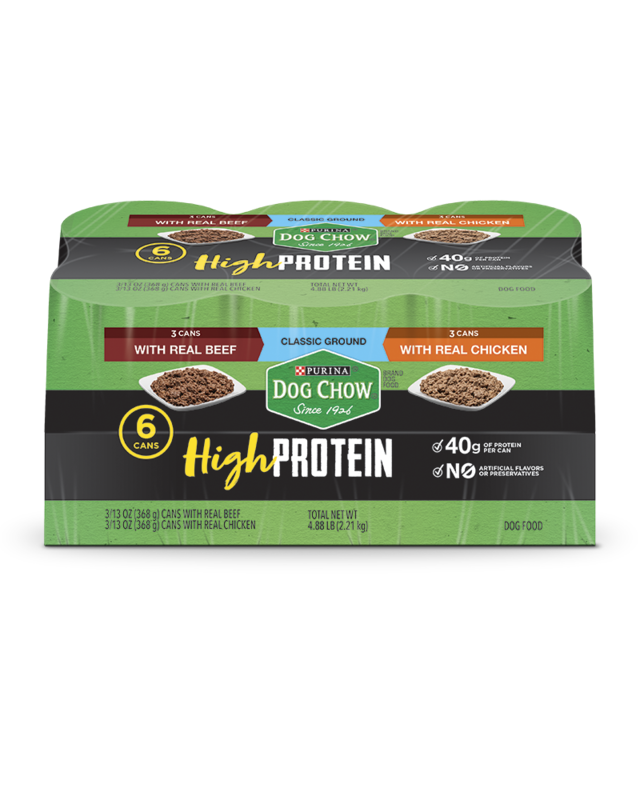 And with high-quality ingredients, no artificial flavors or preservatives, and 100% balanced adult dog nutrition, you can feel great about delighting him with this high protein wet dog food day after day.